Each of these terrific walks takes four to five hours at a relaxed pace. Choose one - or more - and I'll design you a gem of a walking trip: four to seven days of lovely scenery, delicious food, and charming old-world-style lodging. We meet in Rome and go! It was just what we wanted." 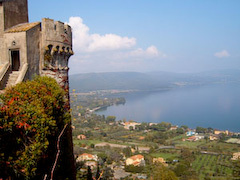 The medieval hill town of Bracciano is crowned by the famous Odescalchi Castle overlooking an azure-blue volcanic lake. There's another lake panorama at the nearby church of San Liberato, built with recycled Roman columns and surrounded by a lovely botanical garden. With a bit of detective work, the ancient Via Clodia can be traced through the forest, passing the mysterious remains of a medieval settlement. We emerge at Oriolo Romano, a Renaissance-era "planned community" built by an idealistic nobleman; the original street plan remains intact. 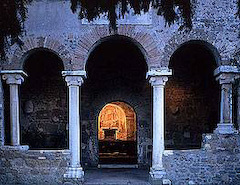 From here a wide, elm-lined pathway leads to the tidy village of Monte Virginio, where a 17th-century hermitage still offers solace to contemplative souls. This third-century-B.C. road hugs the slopes of the Cimini Mountains, managing to avoid several deep canyons opening just to the east. 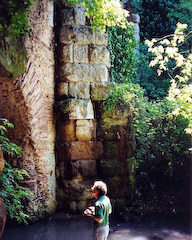 Still, a few stone bridges were unavoidable in the rugged terrain. 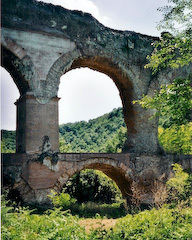 One arched structure is still used by farm trucks; the formidable remnants of others hang from cliffs. 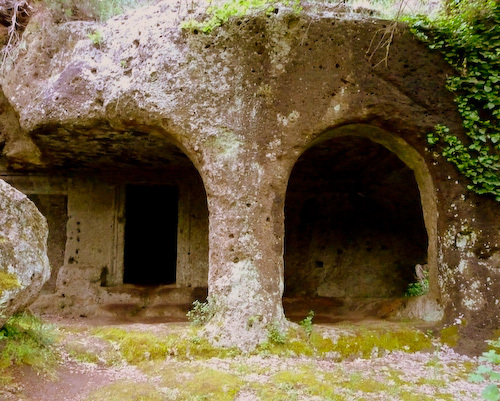 On our walk we pass striking tombs and road cuts of the earlier Faliscan civilization, a hilltop ghost town from medieval times, and a plethora of Roman works. 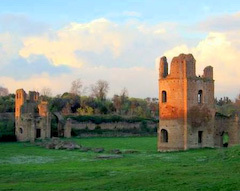 A monumental Renaissance fortress guards the town of Civita Castellana, site of a Faliscan stronghold destroyed by the Romans. On a rocky spur between deep gorges, it offers a stunning panorama that highlights Mount Soracte, celebrated in ancient poetry. 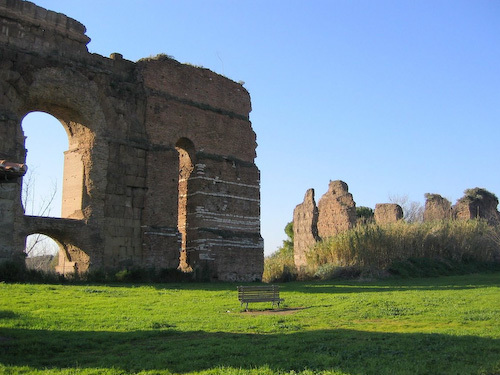 Four of ancient Rome's eleven aqueducts passed through the foothills east of the city, close to where the little town of Gallicano now sits. Topography dictated their path: a steady, gentle downward slope would keep the water flowing smoothly. But here the terrain became inconveniently ragged. 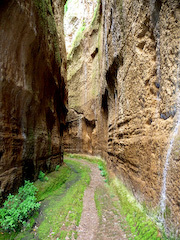 To avoid an awkward series of switchbacks, valleys had to be bridged and mountains pierced by tunnels. 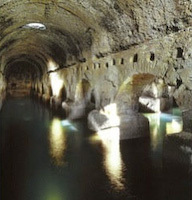 What remains is a staggering series of constructions hidden in the hills - a testament to the Roman obsession with water and the proficiency of their engineers. Our day concludes at one of the wonders of the ancient world: the tall colonnades of the final run of the aqueducts into Rome. 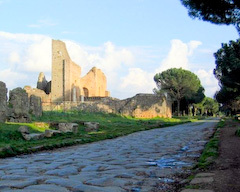 Perhaps the world's most famous road, the Appian Way heads straight from the city gates toward the dark, volcanic mass of the Alban Hills. The crowd of tourists at the beginning quickly dissipates; almost no one walks the whole ten miles to Bovillae. 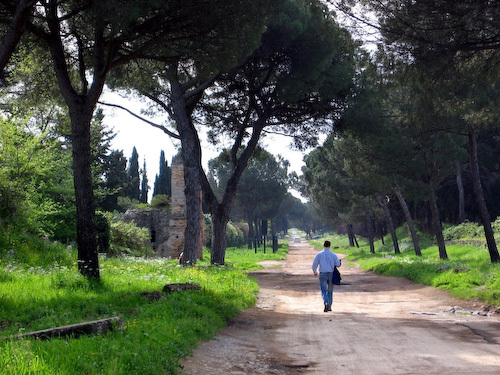 Yet this is the classic Roman road walk: the stones where legionaries once marched now traverse a lovely archaeological park, the last big chunk of unspoiled land around Rome. Sheep graze in the shade of ancient tombs, temples and villas. 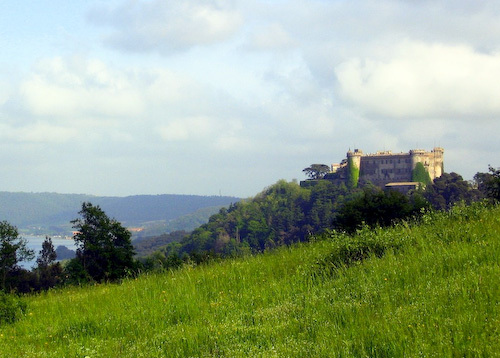 At the foot of the Alban hills rests Bovillae, home to the Julii clan and scene of tumultuous historical events. A roadside stand offers delicious porchetta, tasty local wine and picnic tables under the umbrella pines - an ideal spot for savoring our walk. 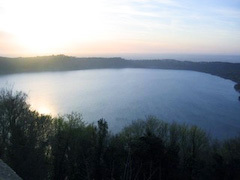 The beautiful volcanic lakes of Albano and Nemi hide many secrets: the sacred spring of an ancient nymph, traces of vanished religious sanctuaries, water tunnels, caves and strange carvings. 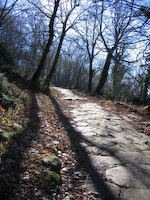 A dense fabric of Roman roads includes one that climbs to the top of a mountain - steep for a Roman road, and quite well-preserved. We pass through a forest of chestnuts and oaks, enjoying one lake panorama after another. In the town of Albano we descend into a huge third-century cistern where stone colonnades support a vaulted roof - magnificent, and still in use. 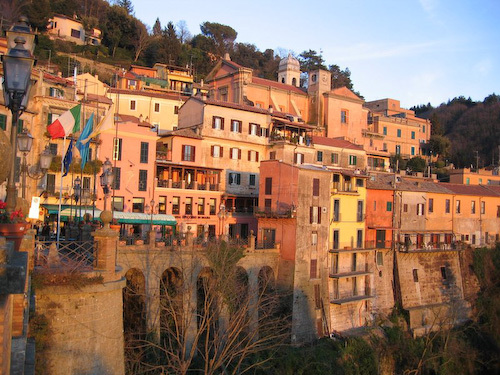 The colorful village of Nemi has a spectacular lake overlook and very good restaurants. Any of these (or a combo) can be expanded into a walking trip - four to seven days or more - for your party (two to six). Can't decide? Write to me - I'll make it easy. There's no "tour group" to join - you choose the number of days, how far we walk, and accommodations that suit the style and budget of your party (two to six). The itineraries are my own discoveries, little known to tourists. Four-day trips begin at about US$1300 per person, seven-day trips about US$2100 (double room occupancy; single supplement 20%). 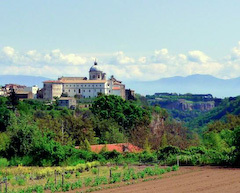 Includes all lodging, meals and transportation within Italy. Air fare to Rome not included. Write to me and we'll discuss your ideas - there's no obligation. 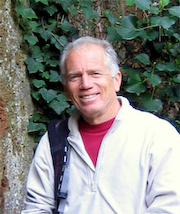 I'll be in Italy in May 2011 (other dates can be arranged). For descriptions of the itineraries and more information, please see www.romanroadwalks.com or write to me.